On Tuesday September 04, 2012 Judge Legrome Davis from the Eastern District Court of Pennsylvania ruled against the Langbords in the case of the 10 - 1933 Saint-Gaudens Double Eagles. The judge agreed with the U.S. Government, indicating that the coins in question, were not lawfully removed from the United States Mint. According to Barry Berke one of the attorneys for the Langbord family, the Langbords will be filing an appeal before the 3rd Circuit. In 2002, one example of the 1933 Saint-Gaudens Double Eagle sold at auction for approximately $7.6 million, a record for any coin sold at auction. Therefore, the value of the 10 remaining 1933 Saint-Gaudens Double Eagles are in the tens of millions of dollars for the entire group. In 2003, the Langbord family discovered the 10 - 1933 Saint-Gaudens coins inside a safe belonging to their relative Israel Switt. They asked the U.S. Government to authenticate the coins and since then, the Langbords and the Government have been through several legal trials both claiming ownership of the coins. It will be very exciting to continue following this story and we will keep are readers posted on any further developments. The Proof 1889 Quarter Dollar benefits from the low mintage of its circulation strike counterparts. Only 12,000 Mint State 1889 Quarters were made, placing considerable pressure on the Proofs by collectors who need an example of this date for their collections. Proof examples of this date are fairly plentiful in PR63 to PR65, but anything nicer is decidedly rare. Cameo examples make up approximately one-fifth of the total population, whereas Deep Cameo examples account for less than three percent. The finest 1889 Proof Quarter is a single PCGS PR68 (non-Cameo). Check out this coin and 30,000 other U.S. coins on PCGS CoinFacts. (Paris, France) - Professional Coin Grading Service has expanded its services in Europe with the opening of a new, larger submission center in Paris and the creation of the PCGSEurope.com web site that includes useful coin information in five languages for collectors and dealers as well as easy-to-use coin submission forms. "We are now accepting coins in Paris directly from members of the PCGS Collectors Club as well as from PCGS Authorized Dealers in the European Union. Many collectors and dealers in Europe see the advantages of third-party authentication, grading and certification, and have been quite enthusiastic about PCGS since we opened our first grading office in Paris in 2010," said Don Willis, President of PCGS, a division of Collectors Universe, Inc. (NASDAQ: CLCT). PCGS TrueView Imaging Service Now Only $10! The PCGS TrueView™ Imaging Service provides high-quality images of each coin at the most opportune moment - right before the coin is encapsulated. And now you can have these beautiful images for only $10 per coin, regardless of the coin's value! This popular service offers the advantage of having your coins photographed outside the holder, free from any glare or potential scratches (on the slab), or free from the prongs of the gasket. It's especially advantageous for more colorfully toned coins! Each image gives an unobstructed view of the coin a format that can be used for a number of numismatic and commercial purposes. Despite being a clad coin, the Eisenhower dollar has much in common with Morgan and Peace dollars in terms of the abundance of curious varieties and the fact that all three series in mint state generally fall within the MS-63 and MS-64 band. The fact that the "Ike" is typically found lacking in eye appeal and heavily scuffed is one of the reasons why mainstream publications like Whitman's Red Book chooses to list MS-63 as the coin's only uncirculated grade. 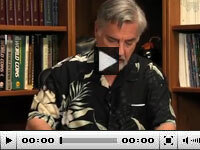 David Hall's Rare Coin Market Report - 09-10-12. Watch video! Building a meaningful collection of coins or of any other collectible takes planning and hard work, not to mention some good luck, knowledge and money. The winner in this issue will receive a 1830 Large Cent in a special PCGS holder indicating eCollector issue #100. Check the next issue to see if you won. Good luck! Last week's winner was Ray Williams. Congratulations Ray! Please send an email to [email protected] to claim your prize. 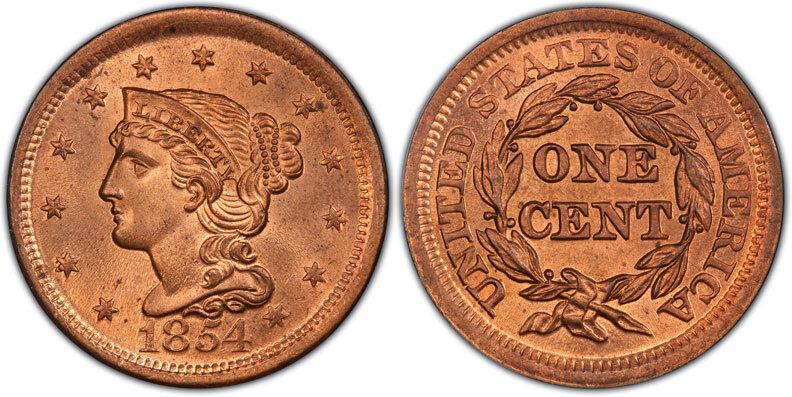 What Grade did PCGS Assign this 1854 Large Cent? Last Week's Correct Answer for the 1916 Lincoln cent was AU58.